Firefox offering some new incredible features in its upcoming version 4. 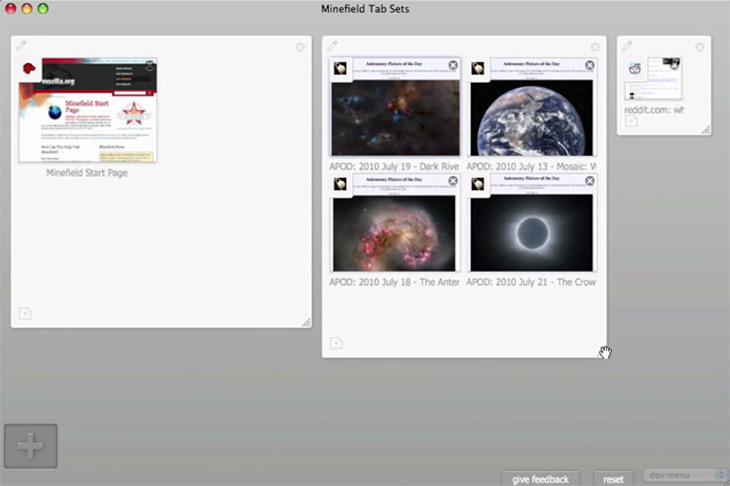 One of the new features is Firefox Panorama (formerly known as Tab Candy) which provides an excellent way of organizing tabs for someone like me who keeps at least 3 dozen tabs opened at any time. I think it is one of the best browser features after tabbed browsing itself. Another feature that I liked is browser settings synchronization on multiple devices for bookmarks, open tabs, passwords and history. I’ve been using Xmarks to sync my bookmarks and opened tabs but with this built-in function, I’d be less worried about keeping things organized on one browser at least. There are several new under-the-hood improvements and features such as support for multi-touch and WebM in addition to HTML5 and CSS3 but no word on improving memory usage though. Firefox 4 beta can be downloaded from here.